The park's plaque at the entrance to the park. Located in the town center of Secaucus just of the corner of Paterson Plank Rd. 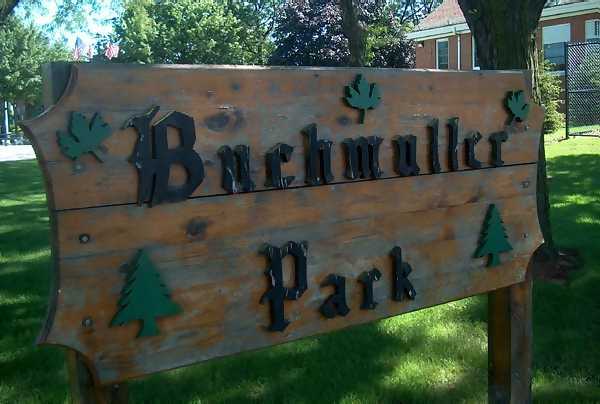 and Plaza Center Drive, Buchmuller Park is the neighborhood park that has been revitalized in the last few years to be the summer venue for outdoor events in Secaucus. 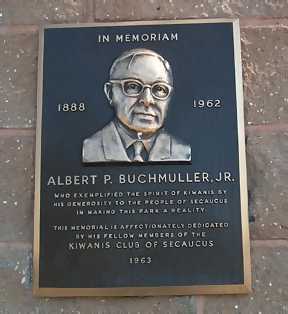 Dedicated to the memory of Albert P. Buchmuller Jr. for his efforts with the Kiwanis Club of Secaucus. 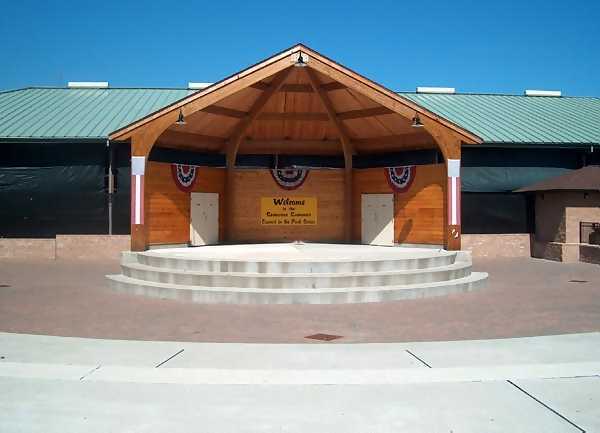 Today the park boasts a new band shell and stage and sunken amphitheater that suits its calendar of outdoor concerts well. The remainder of the park features a new playground and snack bar area and a skating rink. A panoramic view of the park from the sunken amphitheater. In 2004, HSC began a pilot program with the town of Secaucus to bring one of our Shakespeare performances as a new feature of their expanding outdoor programs. In August, we performed a production of Shakespeare's fantastical comedy Cymbeline to a very receptive audience. Pictures of that performance can be seen here. 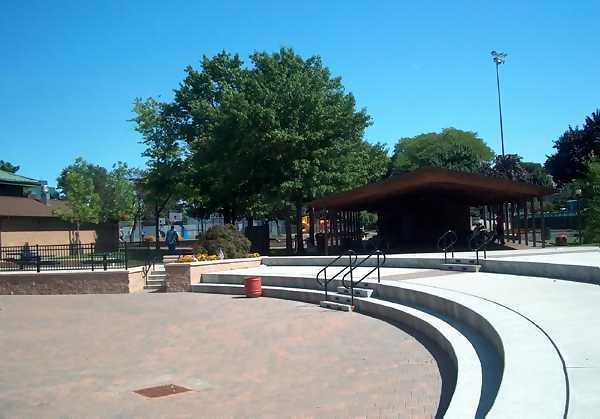 A view of the staging area, the park's band shell. The dedicatory plaque for Albert Buchmuller located on the entrance gate of the park. From NYC BUS: From Port Authority Bus terminal take the NJ-129 or NJ-124 to the stop of Paterson PLANK ROAD and IRVING PLACE. Continue one block WEST and make a LEFT at PLAZA CT. Park is a half a block down on your RIGHT, across from an ACME Supermarket..
FROM NYC DRIVING: Take the LINCOLN TUNNEL to RT 495 WEST to RT 3 JUNCTION and take the RT 3 LOCAL following signs to SECAUCUS. Follow service road through local developments until you come to the junction of PATERSON PLANK ROAD. Make a LEFT on to PATERSON PLANK ROAD and follow to the corner of HUMBOLDT STREET and make a left on to PLAZA CT. PNC Bank on this corner. Park is a half a block down on your RIGHT, across from an ACME Supermarket. From RT 3 East: After passing the junction for RT 17, bear right on to the RT. 3 SERVICE ROAD following signs for SECAUCUS. After passing the NJ TURNPIKE overpass and crossing HACKENSACK RIVER, you will come to the corner of PATERSON PLANK ROAD. Make a right on to PATERSON PLANK, and follow to corner of HUMBOLDT ST, PLAZA CENTER DRIVE. Make a LEFT on to PATERSON PLANK ROAD and follow to the corner of HUMBOLDT STREET and make a left on to PLAZA CT. PNC Bank on this corner. Park is a half a block down on your RIGHT, across from an ACME Supermarket. From RT 3 West: Follow directions for NYC Driving. 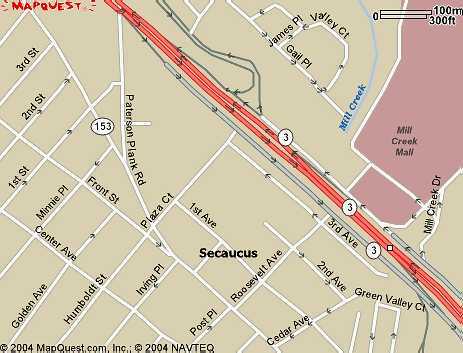 To view the Secaucus, NJ page.